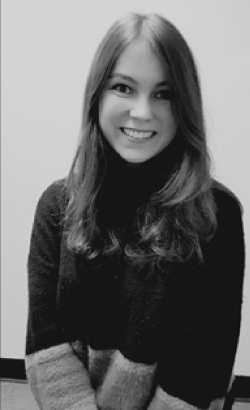 Congratulations to the 2018 Travel Bursary winner! with a thesis on The neural mechanisms of action selection and specification. The award contributed to expenses to attend a conference on Concepts, Actions and Objects in Trento, Italy. BFWG Prizes are awarded in competition to female 3rd Year Ph.D. students of any nationality studying at a British University. BFWG Awards are awarded in competition on the basis of overall academic excellence. In effect they are prizes for outstanding academic excellence. They are not intended to meet financial need. If you are looking primarily for help with living expenses (fees must be paid) please go to Funds for Women Graduates (www.ffwg.org.uk) which is run TOTALLY INDEPENDENTLY of the BFWG Prizes programme. You are entitled to apply both for BFWG awards and for FFWG grants but the application processes and addresses to which applications and references should be sent are totally different (see www.ffwg.org.uk for the Funds for Women Graduates eligibility and application process). The British Federation of Women Graduates prize awards are for women who will be in their third year of doctoral studies or part time equivalent in early autumn of the year of application when the awards are given out. Please consult the eligibility criteria about start dates and planned thesis submission dates. We regret those studying for professional doctorates are not eligible. The awards are given on the basis of evidence of academic excellence as shown on the application form, referee reports and, for those shortlisted, brief presentations of their research to a panel of academics. The amounts offered in awards range upwards from £1000 with the average award being around £3000 and the maximum being £6000. The number of awards made each year depends on the funds available and on the quality of the applications but six to ten awards are usually given. The final selection is made in June/July of each year and awards are given out in October/November. To be eligible to apply for a BFWG award for the year 2019/20 you must be: A female postgraduate student who commenced full time doctoral studies (PhD, DPhil, DMus etc.) between September 1st 2016 and October 31st 2017 or a part time student at an equivalent stage of her studies. You must be registered at a university in England, Wales or Scotland (not Northern Ireland). Awards are given to help with on-going doctoral work rather than as prizes at the end of doctoral studies so please do not apply if you expect to submit your thesis before the end of February 2020. Awards are not given out unless fees for the year from October 2019 have been paid, covered by available funds or waived by the university. Applications close on Friday February 22nd 2019. You can only make an application for a BFWG scholarship once. However, if you are a holder now, or in the past, of a Funds for Women Graduates/FfWG/BFWG Charitable Foundation grant or if you are applying for an FfWG grant this year, you may also apply for a BFWG scholarship provided you meet the BFWG Scholarship eligibility criteria. Am I eligible to apply? Click ELIGIBILTY to find out. Only email applications will be accepted. To make an application for a BFWG award, download and complete the APPLICATION FORM. Email this back to awards@bfwg.org.uk giving the subject heading of your email ‘AWARD APPLICATION’ and at the same time ensure that you have followed the instructions for sending the £20 non-refundable administration fee through PayPal as described on the form. Please make sure that you record the reference number of your PayPal transaction, the date of the transaction and the name on the Paypal account from which the payment is made if this is not yourself or if it is under a different name from the one you use on your application form. (This is to clarify who has sent a payment We do not use this information for anything else). That you have made your £20 Paypal payment. That you have completed the application form. Please include the 2000 word summary of your research as part of the application file and do not send it in a separate file. 6. We do acknowledge all applications received but this can take some days if we are getting a great many applications. Please do NOT write asking if we have received your application unless it is over two weeks since you sent the application and you have not had an acknowledgement. The same applies to the referee reports – we acknowledge all we receive but the process may take some days. 7. Shortlisted candidates will be informed probably before the end of June but shortlisting has been severely delayed in the past few years due to the number of applications (and sometimes chasing up missing references so please do encourage your referees to write before the closing date). Those candidates shortlisted will be asked to give a presentation in BFWG’s London headquarters in June/July 2019. If you are unavailable on the relevant date we do our best to make alternative arrangements such as a Skype interview. At the interview those candidates shortlisted will be asked to speak for eight minutes on their research followed by questions from the interviewing panel of academics. Throughout the application assessment, the criteria for making awards are a student’s overall academic excellence, quality of research and ability to communicate this. AM I ELIGIBLE TO APPLY FOR A BFWG SCHOLARSHIP? The following questions and answers may help you decide if you are eligible to apply for a BFWG award. If you have to answer ‘No’ to ANY questions, then you should NOT apply. 2. Are you doing research towards a research doctorate (PhD, DPhil, DMus etc)? (Students studying for a professional doctorate are NOT eligible). Are you registered for your doctorate at a university in England, Wales or Scotland? 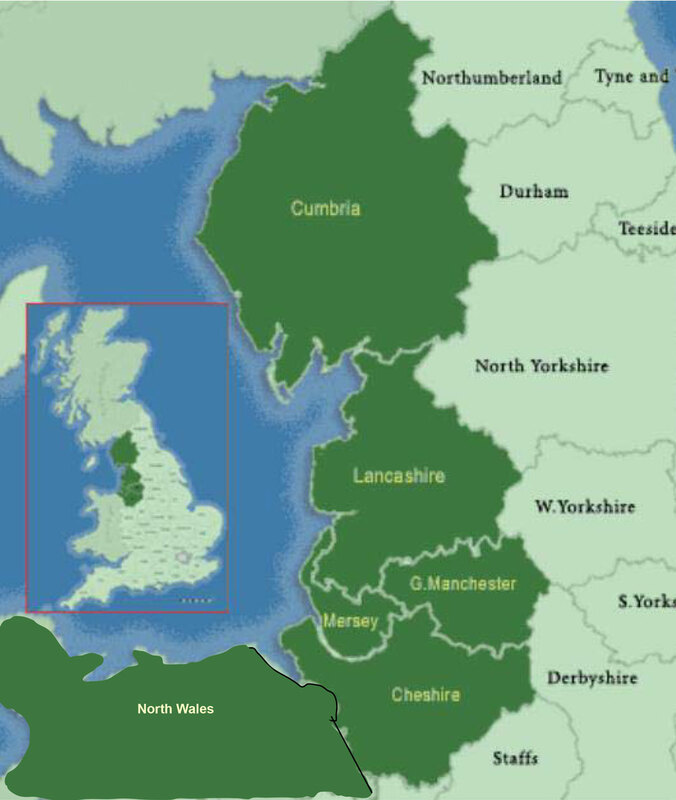 Are you at least temporarily resident in England, Wales or Scotland? Yes, proceed to Q5. No: you are not eligible: We are unable to accept applications from distance learners overseas. 5. Did you begin full time doctoral studies between September 1st 2016 and October 31st 2017? If you are a part time student these dates may not apply. See * below. No: full time students commencing outside these dates are not eligible. 6. Do you expect to be still be working on preparation of your thesis at the end of February 2020? No. You are not eligible. We intend our awards to be for those with a significant period of their doctoral work ahead of them rather than giving the award to those who finish in the next three months. If in doubt contact awardsqueries@bfwg.org.uk. 7. Will your fees from October 2019 be covered, waived or payable? 8. Is this the first time you have applied for a BFWG Award? (Please note that we are referring to BFWG Scholarships/Awards here. Those who are applying for, or who are present or past holders of grants from Funds for Women Graduates (FfWG) may also apply for BFWG awards provide they meet our other eligibility criteria). If Yes, then proceed to Q9. If No, you are not eligible if you have applied for a BFWG Award/Scholarship before. 9. Can you afford the £20 administration fee that goes with the application? This fee is not refundable. No: if you cannot afford the administration fee, please do not apply. Portraiture and the radical parliamentary reform movement 1760 – 1820. An-other road: Route 5, materiality, mobility and Chilean identity discourses . The property tax collector: taxpayer and the compliance equilibrium. A case study on property tax compliance among residential property taxpayers in three Jamaican parishes. A Trial of Intra-pleuraL immunoTherapy in mesothelioma (the TILT trial): a feasibility study using the trial within a cohort methodology. Neurodevelopmental effects of HIV and ART exposure: a prospective neuroimaging study of uninfected children born to HIV-infected mothers. Towards the ethics of response: healing and reconciliation after mass atrocity and genocide in the cases of Distomo and Auschwitz-Birkenau. Shifting ecologies of care in post-earthquake Nepal: an ethnography of psychiatric humanitarian practice. Production of functional erythroid island like macrophages from induced pluripotent stem cells by genetic programming to recapitulate the erythropoiesis niche in vitro. Effects of bilingualism upon social cognition and perspective taking processes in adults with autism and their neurotypical peers. Social robots for persuasion and motivation (with an application in rehabilitative therapies). Department for Critical and Cultural Theory, School of English, Communication & Philosophy, University of Cardiff The highs and lows of modernism – a cultural deconstruction It is regretted that Emma West was omitted from the list printed in the Autumn edition of BFWG News. London School of Hygiene & Tropical Medicine The effect of a community health worker intervention on women’s health and health seeking-behaviour in Gujurat, India. Oxford The bacterial flagellar motor. Faculty of English, University of Oxford Ageing women in Shakespeare’s drama. Dept. of Physics, University of Strathclyde, Glasgow Characterisation of nanostructured light emitters. Dept. of Archeological, Geographical & Environmental Science, University of Bradford Palaeolithic fishing in Europe. Inorganic Chemistry, Dept. of Chemistry, University of Oxford Electron paramagnetic resonance studies of metalloenzymes. School of Physics, University of Exeter Metal-enhanced vibrational imaging and spectroscopy of biological samples. School of Oriental and African Studies, University of London. The rise of self governing social organizations and the provision of public goods in rural China. Faculty of Environment, University of Leeds New techniques to determine plant nutrient availability in natural ecosystems. School of Social Sciences and Law, Oxford Brookes University. Comparative ecology and conservation of ring-tailed (Lemur catta) and brown (Eulemur sp.) lemurs in fragmented forests – South eastern Madagascar. I hold a Ph.D. in Philosophy from the University of Edinburgh and the equivalent of a MA (Laurea) in Philosophy from the University of Pisa, Italy. I have been an Official Fellow of Corpus Christi College, at the University of Oxford, since 2011. Before that, I was awarded a British Academy Post-doctoral Fellowship in Philosophy, which I held as a Junior Research Fellow in Corpus (2008-2011). My first appointment was a Lectureship in the Faculty of Philosophy, at Oxford, and in Corpus Christi College (2007). I have edited three volumes and have one monograph forthcoming, and have authored a variety of articles and book chapters in my areas of research: ancient and contemporary metaphysics, the philosophy of mind and the philosophy of religion. I have held visiting fellowships in Germany, Australia, and Italy. I have been the recipient of major research awards from the Templeton World Charity Foundation (2012); from the European Research Council (2010); from the Leverhulme Trust (2008). My training in philosophy in Italy was focused mainly on the study of the history of ideas. When I started my graduate studies at the University of Edinburgh I needed to learn a new analytic methodology (in a foreign language), as well as new philosophical material. 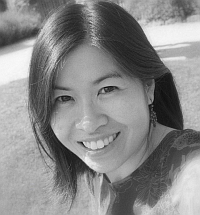 The Scholarship I received from the Federation allowed me to take a fourth year to complete my doctorate – this fourth year was crucial for consolidating my analytic philosophy training, and allowed me to publish even before the submission of my thesis. I thus entered the next stage of my academic career in a stronger position than if I had to hurry to finish my thesis within three years; and my first appointment was a lectureship at the University of Oxford. I would like to thank you for supporting me through a BFWG scholarship which helped me through the last year of my PhD. Thanks to your support, I was able to complete my PhD successfully and I received my doctorate within the 3 years. In particular, the extra funding provided by the BFWG enabled me to reduce my teaching load in the final year to concentrate fully on my research. Following the completion of my PhD in Genetics (in Cambridge), I worked for two and a bit years at the Institute for Animal Health in Pirbright, Surrey, developing epidemiologic models of transmission of bluetongue disease through British livestock. These models were particularly influential in the management of the bluetongue epidemics which affected the UK in 2007-2008. I was also closely involved in the working group which designed the control and prevention strategy against bluetongue in Scotland. At the end of 2008, I moved to the Southwest of England and started working at the School of Veterinary Sciences, University of Bristol. My research since then has involved investigating risk factors involved in the transmission and persistence of bovine tuberculosis in the Southwest of England. I am currently working as part of a team developing a new and exciting statistical software engine, Stat-JR, which aims to provide social and natural scientists a more intuitive environment for analysing complex datasets and fitting advanced statistical models. I would like to reiterate my very sincere gratitude to BFWG for awarding me The Mary Bradburn Scholarship as without it I will probably not be where I am now. From 2009-2012 I was a post-doctoral fellow in politics and international relations at Exeter College, Oxford, before taking up the post of Lecturer in the Department of War Studies at King’s College London in 2012. 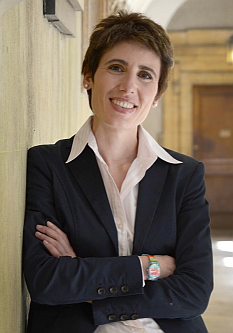 After I received the BFWG scholarship, I spent a year on exchange at Yale University, then won a fellowship to the Department of Foreign Affairs in Canada, and then returned to the UK to take up a junior research fellowship in Oxford. My DPhil, which the BFWG scholarship supported, was on Extralegal Groups, Natural Resources, and Statebuilding in Post-Conflict Liberia. I maintain broad research interests in post-conflict transitions, peacekeeping, organized crime, corruption, and African politics. Recently, I published a co-edited volume entitled Corruption and Post-Conflict Peacebuilding (Routledge, 2011) as well as other book chapters related to this theme. I am currently working on a book manuscript that builds on my dissertation on extralegal groups. Hopefully soon I will also have a book contract! My next project will be on the evolution of anti-corruption norms. Perhaps of interest to BFWG members, I also have a separate (and slightly indulgent) research interest on women in politics. I co-authored a journal article showing that political candidates are more likely to be female if the local party gatekeeper is also female. You would think that this would be a somewhat obvious result- but proving that this is so is harder than you might think! The article was published in Political Research Quarterly and is entitled: Informal Influences in Selecting Female Political Candidates. In the last two years, I have also begun to blog and tweet about international affairs. My commentaries have appeared in the Wall Street Journal and al Jazeera, and I have spoken about African politics (on TV and radio) for a number of media outlets including the BBC and Radio France International. During this time I also had a son. He was born while I was on exchange at Yale. He is now three and a half years old. FfWG offers Foundation Grants to help women graduates with their living expenses (not fees) while registered for study or research at an approved institution of higher education in Great Britain. The criteria are the proven needs of the applicant and her academic calibre. Foundation Grants will only be given for the final year of a PhD or D.Phil. The closing date for applications tbc and the grants are awarded in July for the following academic year. FfWG offers Emergency Grants to graduate women who face unforeseen crisis (not with fees) whilst engaged in study or research at an approved institute of higher education in Great Britain. These grants will be offered twice a year in May and November. The bursary is offered annually to women graduates who research in History or English Literature ,require. a short residence in London in the summer. It provides accommodation in a hall of residence for up to 4 weeks between end of June and mid September. FfWG Fellowships funded by FfWG are intended to encourage advanced scholarship and relevant research to the mission of Graduate Women International (GWI). It requires 12 months work in a country other than that in which the applicant was educated or habitually resides, but is reserved for applicants wishing to undertake research in Great Britain. One award with a value of £6,000 is available on tbc. The FfWG fellowship is awarded in alternate years. Please refer to the ffwg.org.uk website for further details. 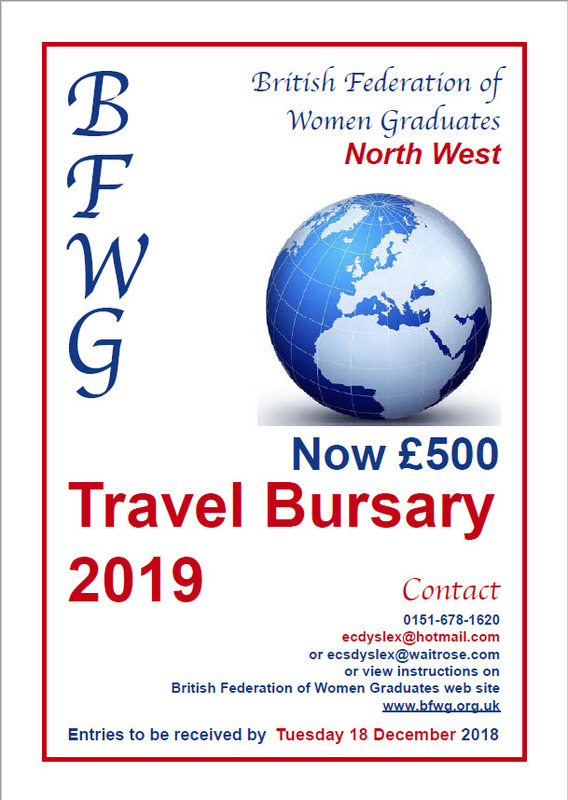 BFWG North West offers a bursary by competition of £500 to enable a woman postgraduate student to attend a conference relevant to her studies or research in 2019 and free introductory membership of BFWG for a year. * Must be a woman postgraduate studying at an Institution of Higher Education in North West England or North Wales and resident in the United Kingdom at the time of the Academic Presentation Day in October of that year. – Her name, address, telephone number and email address. – The name of her institution of Higher Education. – The title, date, venue and organiser of the conference. – A title to the research so that the topic is immediately obvious. – Not less than 100 words of clear information on the present research and its validity. – A supporting statement clearly describing why the bursary is relevant to her studies. * Must include written support of the application signed by the head of her Postgraduate School or Department. BFWG North West, 28 Ferguson Avenue, GREASBY, Wirral, CH49 1RP and marked North West Travel Bursary in the top left-hand corner of the envelope. * Must reach that address by Tuesday 18 December 2018. * Will be informed of the result in early January 2019. * The winner will be invited to speak about the conference and her studies at a North West Regional Meeting in October 2019. All Bursary competitors will be asked if they would also be prepared to compete by invitation at an Academic Presentation Day for prizes. * Certificates of attendance will be given to any student who attends, whether competing or not. * Good presentation with a typed application. * Explain clearly and simply the topic of research so that anyone can understand its purpose. * Explain the importance of the conference to the research. * State whether a paper or poster is to be presented to the conference or not. * Give the date and venue of the conference. * Enclose a good supporting letter from the applicant’s professor, supervisor or head of department. * Give a description and level of previous degree(s). Graduate Women International (GWI) empowers women and girls through lifelong education . Education, both formal and informal, underpins effective change. GWI encourages graduate women to use their expertise to bring about change with particular reference to the education of girls. The fellowships and grants offered by GWI and its national affiliates support the research study and training needed to open doors to quality higher and continuing education for women and girls throughout the world. Many of GWIs national affiliates offer fellowships, grants, awards and stipends to women and girls for primary and secondary education undergraduate studies and postgraduate research and training. This event takes place annually at BFWG Headquarters in May in London and offers a prize of £120 for the winning presentation. GWI offers the Hegg Hoffet fund programme to assist graduate women who have been displaced as a result of war, political upheaval, or other serious emergencies. The Hegg Hoffet programme offers grants for courses such as refresher courses that validate entry into professional fields, training courses leading to employment, language training and other courses to assist with integration into a new country.